This classic self-drive takes you on a full circle around Iceland. The basic circle is only 8 days, which can be viewed as a good introduction to what Iceland has to offer. To further explore you should allow additional days. You can choose from a list of areas, adding just few of them or all, depending on how much time you have on your hands. Upon arrival at Keflavík airport you pick up your rental-car. As you drive to Reykjavík, you have the option of exploring Reykjanes peninsula and visiting the Blue Lagoon. Your first day on the road is assigned to the famous Gullfoss and Geysir area, often called The Golden Circle. Visit Þingvellir National Park, a UNESCO World Heritage site, important to Iceland because this is where the Vikings established their parliament in year 930AD, but also a remarkable geological site, where the tectonic plates of America and Eurasia meet, and you can walk cross the rift. You also visit Gullfoss waterfall and Geysir hot spring area, the only location in Iceland where you have a spouting geyser, erupting every 10-15 minutes. The day ends in the area of volcano Eyjafjallajökull, which erupted in spring 2010 and caused thousands of flights in all Europe to cancel. Today you visit Skaftafell National Park, nesting at the slopes of Vatnajökull glacier, the largest glacier in Europe. The park offers endless possibilities of hiking, short and long, easy and difficult. You can do many walks by yourself, or join in on guided tours. If your interest is to walk or climb on the glacier, there are guided tours (this you should never do by yourself). The area also offers bird watching tour on a hay wagon (summer only) and a stop at Jökulsárlón glacier lagoon is a must, viewing the floating ice bergs. As you continue to circle Iceland, today travel will take you along the east fjords. The road lingers along the coast line, passing through a small fishing village in every fjord. Fishing has always been very important to Iceland, it now accounts for about 1/3 of the national income, and in these village life is all about fish. Lake Mývatn area is one of the nature pearls in Iceland. This volcanic area had its last period of eruptions in the years 1975-1984 and you can walk to the latest crater at Leirhnjúkur, still steaming hot. Lava formations, old and new, as well as the geothermal heat connected to the volcanism, shape the whole area. You can hike in Dimmuborgir rock formation, that once was a lava lake, stop at Skútustaðir craters, Hverarönd geothermal area with bubbling mud pools or take a bath at Mývatn Nature baths, natural geothermal water. The focus of today is the farmland of north Iceland, the wide valley of Skagafjörður. The farmers still value the Icelandic horse and many of them here do not know how many horses they have, but all horses in Iceland are owned by someone, they are not wild, though they may seem to be, as they are fare out in the fields. There are good opportunities for riding tours in this area, but also for white water river rafting. As you close the circle, you travel through to Borgarfjörður area, with Hraunfossar and Barnafoss waterfalls, as well as Reykholt Medieval center, where many of the Icelandic Sagas where written in the years around 1200-1300AD. Here you also have a unique opportunity of a tour into the glacier Langjökull, where you actually go inside the glacier into a manmade tunnel, after driving up to the top in a monster truck. 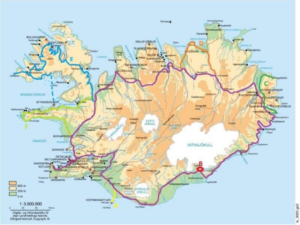 Your departure day, drive to Keflavík International airport and return the car, in connection with your flight. The Westman Islands are a great stop for those interested in volcanic activity. In 1973 a part of the town went under lava and the inhabitants had to evacuate the island. Eldheimar museum offers an inside view into these events. Ferry from Landeyjahöfn with return after an overnight in the Westman Islands. Skaftafell and its surroundings offer a unique proximity to Vatnajökull, Europe‘s biggest glacier. Stay an extra night in the area to take a guided glacier walk, enjoy a boat trip on Jökulsárlón glacier lagoon, try snowmobiling or hike around Skaftafell National Park. Driving the mountainous fjords of the Eastfjords is a powerful sight. A day ending in BorgarfjörðurEystri is something no bird enthusiast should miss as it features a special Puffin Harbor for viewing this popular bird. Being on the volcanic zone which bisects Iceland, Mývatn is a geothermal hotpot and a few days are needed to explore its surroundings. This area offers a lot of things to do and see; Mývatn Nature Baths, Ásbyrgi National Park, Dettifoss (Europe‘s most powerful waterfall) and Whale Watching from Húsavík, to name but a few. The sparsely populated Westfjords region is an ideal destination for those looking to explore a bit off the beaten track. With bundles of dramatic landscapes, rich folklore and untouched nature a view of waterfall Dynjandi, boat trip to Vigur Island, a walk on Rauðisandur (red beach) and a hike around Látrabjarg cliffs are some of the many highlights. Snæfellsnes peninsula is often referred to as Iceland in a Nutshell. Featuring its own version of Iceland’s top attractions; beaches, fishing villages, colorful mountains, farmlands, a glacier, dramatic landscapes and a National Park – all in a relatively small area. Rental Car for 7 days, unlimited mileage, CDW and TP, Third Party Liability, one driver and Keflavík airport tax. Site info with suggested places to visit. Access to GoNorth 24hr emergency phone. Rate per night, see program description for possible add-ons. Children 6-12 years old pay as presented above when sharing a room with parents. Max 1 child per room. Children 0-5 years free of charge when sharing a room with parents. Children 13 years and older need to book double + extra bed standard rate.